A full year on from the release window Hermann Hauser had first let slip in June 1982, the Electron was launched, at the 1983 Acorn User Exhibition, held that year in London’s Cunard Hotel in Hammersmith on the 25 August. Potential Electron buyers would have been pleased to see many an add-on for the new machine on show too. What they saw from Acorn was a cream-coloured unit closer in looks, perhaps, to the Acorn Atom than the BBC Micro. 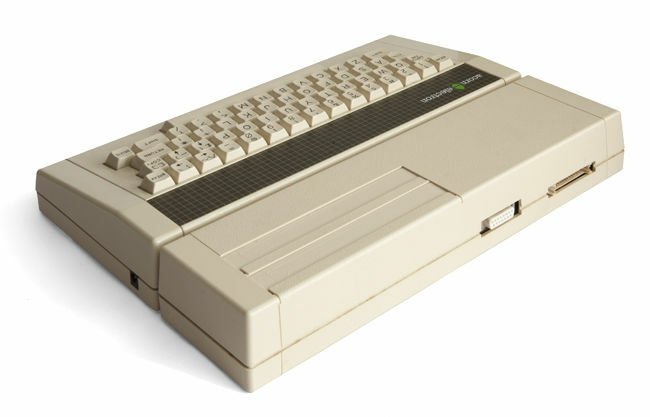 The casing was styled by long-time Acorn collaborator and industrial designer Cambridge Product Design’s Allen Boothroyd, who had previously designed the Acorn Atom and the BBC Micro cases. Inside was a 6502A processor running at 2MHz (when accessing ROM, slower when touching RAM) and hooked up to the aforementioned four 64Kbit Ram chips, two 16KB ROMs and Steve Furber’s monumental ULA. At the launch, Hauser boasted: “[The ULA] is by far the largest custom chip anyone has put in a micro, with over 2400 gates.” The chip would require 68 IO lines and measure 30 x 30mm. 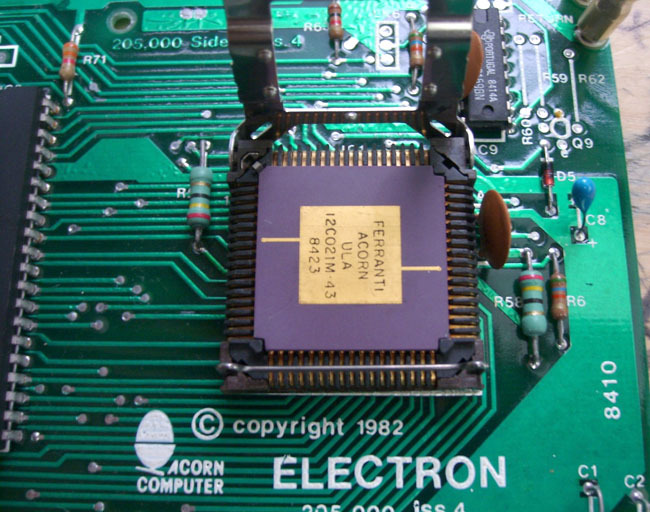 It would be the largest chip on the Electron’s motherboard, bigger even than the computer’s 6502 processor. This was true too to a lesser extent of the BBC Micro, but Acorn seems to have been particularly keen to obscure as much of the Electron’s circuitry as possible. “I defy anyone to copy that chip,” Hauser said in August 1983. No longer was the Electron set to ship for as little as £120 - it would now retail for £199. That was more than the 48KB Spectrum cost at launch and even more so now that Sinclair had cut its top-of-the range computer’s price to £129.95. Thanks to the Electron’s lack of Mode 7 and of many of the IO ports and slots found on the BBC, Acorn’s software arm, Acornsoft, said it was busily tweaking 12 of its most popular programs to make them fully compatible with the new machine. Acornsoft chief David Johnson-Davis said he expected it to be six months before the Electron’s software library was of a size to match that of the BBC. Johnson-Davis also made sure that two young programmers then quietly hard at work on a novel space trading game complete with fast 3D wireframe graphics were able to make their code run on the Electron as well as the BBC Micro. When Ian Bell and David Braben’s Elite went on sale the following year, on 21 September 1984, it ran on both machines. By launch, Acorn had already begun seeding review machines with the press. The first write-ups appeared toward the end of August 1983, though these early evaluations were based on pre-production kit rather than shipping units, each machine with its own uniquely numbered - written on the top in marker pen - ULA chip. The major monthlies, with long lead times, didn’t get their reviews into print until September or October, but that wasn’t a problem as the Electron wasn’t going to go on sale until that time. Early or late, the reviews were generally favourable. “The Electron gives the impression of being all keyboard. It has a satisfyingly solid feel to it and generally gives the impression of being a very classy product indeed,” enthused Steve Mann in Personal Computer World. “We are told that the casing has withstood the rigours of the British Aerospace testing laboratories,” added Personal Computing Today without any hint of sarcasm or scepticism. “Unlike certain other manufacturers, which let out a squawk and invalidate the guarantee if you even so much as think of reaching for a screwdriver, Acorn positively encourages users to delve about inside,” PCW’s Steve Mann noted gleefully. “The top of the case lifts off after removal of four screws and the ribbon cable that connects the keyboard simply unplugs... The board itself is beautifully laid out, with every component clearly labelled and plug-in connectors for the power lines and speaker leads. However, speed was an issue, reviewers found, especially those used to the BBC Micro. Steve Furber’s ULA may have caused all the delays, but it was the choice of cheap, high density DRAM and its impact on the Electron’s performance that drew the most fire. “A major quirk of the Electron is the way RAM is organised. In the interests of economy, four 64Kb RAM chips have been used, but as these can only be read four bits at a time, memory access time is virtually doubled so that the Electron is dramatically slower than the BBC,” wrote Keith and Steven Brain in Popular Computing Weekly. Putting the video sub-system into the ULA slowed down the graphics too “so that although many games designed for the BBC [Micro] will run on the Electron they proceed at less than half the speed, with very significant effects on their appeal” and thus “spoiling the ship for a ha’porth of tar”, the two Brains complained. Irritatingly for some game coders, the Electron’s ULA lacked the BBC’s ability to quickly scroll the screen sideways. Integration of the sound chip functionality into the ULA limited the Electron to playing only a single sound and a single noise channel at a time, despite supporting multiple channels in its BASIC to maintain compatibility with BBC programs. “As with the Spectrum, the best that can be achieved is simple sound effects for games,” noted Steve Mann in PCW.